WASHINGTON - Any NASA mission that sends a crew of astronauts to visit an asteroid will be fraught with challenges and risks, but the first step for any such endeavor is to understand exactly which near-Earth objects may warrant a human visitation. Asteroid specialists, space scientists, astronauts, and NASA mission tackled that question and others during a recent workshop called "Target NEO: Providing a Resilient NEO Accessibility Program for Human Exploration Beyond Low Earth Orbit." Finding an appropriate target asteroid for astronauts, the experts found, is the most urgent task for any space rock mission. While more than 7,000 near-Earth objects are known, the numbers and physical makeup of space rocks that are accessible by piloted flight is highly uncertain. Doing so will reduce the risk for missions and crew, researchers said. 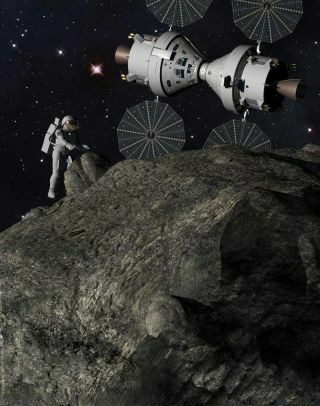 NASA's current goal of sending astronauts on an asteroid-bound mission by 2025 is one of the core ideas in the space exploration vision laid out by President Barack Obama last year. It represents a major shift from NASA's earlier plan, which was aimed at returning astronauts to the moon. "By 2025 we expect new spacecraft designed for long journeys to allow us to begin the first-ever crew missions beyond the moon into deep space," Obama said during an April 2010 speech at NASA's Kennedy Space Center in Florida. "So we’ll start by sending astronauts to an asteroid for the first time in history. By the mid-2030s, I believe we can send humans to orbit Mars and return them safely to earth, and a landing on Mars will follow." The NEO workshop on Feb. 22 was organized by the Space Policy Institute at George Washington University’s Elliott School of International Affairs and Ball Aerospace & Technologies Corp. of Boulder, Colo.
Asteroids are targets that will reduce the risk of all deep space exploration, Jones said. They can deliver continuing value to scientific discovery, planetary defense objectives and the utilization of space resources, as well as hone operational expertise for trekking on to Mars, he added. Only a few near-Earth objects would fit NASA's proposed guidelines for a manned mission to an asteroid. Ground telescopes and space-based infrared surveys have been essential to cataloguing candidate asteroids for human visit, but one fact has become clear to space rock scientists: When it comes to a crewed expedition, asteroid size does matter. Also, some objects that are less than 50 meters across may ultimately turn out to be human-made space debris – the cast off of past robot expeditions, said Al Harris, a consultant to NASA and an authority on asteroids. “You certainly don’t want to go to something painted in titanium paint with writing on it,” Harris said. What’s more, there’s an abundance of NEOs that are “super-fast rotators” – topsy-turvy mini-worlds that, he said, would assuredly make astronaut surveying tough to do. There is some debate on just how much scientists need to know about an asteroid before a manned mission can launch toward the target space rock. Are spin rate, size and shape, and composition — things which can be gleaned in advance by a robotic probe— must-haves before human arrival? What's certain is that sending a crewed expedition to an asteroid will be no cakewalk, said Andy Thomas, a veteran NASA astronaut who serves as an Astronaut Office liaison for organizations planning deep space exploration. "Long outbound and inbound trip times are going to be very challenging," Thomas said. Toss in cramped quarters, radiation issues and lack of real-time communications, he added. To be successful, "we really need a quantum improvement in the life support systems. Right now, space station technology will not do it … The station requires too much continuous up mass," Thomas added. The ability to station-keep with an asteroid without placing crew and spacecraft in harm's way also will be worrisome, Thomas said. "It’ll be a labor-intensive activity once you’re there." Thomas addressed the matter of the public and Congress buying in to a NEO undertaking. "These missions are going to be very, very risky. They are going to be as much risk as the Apollo missions were," Thomas said. "To try and sell it to the public purely on the basis of the scientific return … would probably not work." Planetary defense – learning how to fend off a menacing asteroid that has Earth’s name on it – might be seen as a compelling reason, he suggested, but the question of sending people versus sending robots on a less-expensive mission would need to be addressed. Thomas called upon the workshop participants to establish a "very cogent and clear story" of why it’s necessary to send humans to an NEO. Without that, sustained funding can’t be expected, he said. This NASA concept image shows the International Space Station's Tranquility module (Node 3) at the center of two exploration spacecraft that could be sent to visit a nearby asteroid. Asteroid trek on a shoestring? Getting the ball rolling for an NEO investigation – as well as a planetary defense program and manned asteroid mission – has been a money-starved, slow-going bureaucratic affair, said Richard Binzel, professor of planetary science at the Massachusetts Institute of Technology. "It’s so simple, really," Binzel told SPACE.com. "The first step for human interplanetary flight is to set the destination. A survey mission is one of the most essential and least expensive components of the whole endeavor. How can NASA planners not 'get it'?" Binzel said that the case for asteroid surveys has been made over and over for two decades. "Yet current efforts barely get along on a shoestring. Now, despite national advisory council recommendations, congressional mandates and the newly recognized needs for both exploration and planetary defense, there is no new funding and thus no administrator who wants to get stuck with the bill," Binzel said. "This issue is sorely in need of an adult sense of responsibility." Former NASA astronaut Ed Lu, now a high-tech consultant in Silicon Valley, agrees with Binzel. "Unfortunately, the history of NASA and our great plans over the last 20 years is that we lose interest and they go away," Lu said. What remains true about NEOs, he said, is the adage: "Find them early … find them early and find them early." "But if a human NEO mission is to move forward, the three most important things are, 'Get started now… get started now and get started now,'" Lu added. "The longer you wait on this, the greater the chances it’s all going to turn into one more set of paper studies." Not only do we need to start now, Lu told SPACE.com, "but we need to make quick progress. That means a series of fast visible milestones, rather than a long wait until the first success." A reality check on human space exploration was offered by Scott Pace, director of the Space Policy Institute. He said NASA historically cancels most of its space transportation and human spaceflight programs. "In the last 20 years NASA has spent at least $21 billion, 7 percent of its budget, on canceled space transportation programs," Pace said. Pace posed two questions for future deeps space missions: Can humans "live off the land" in space and function independently off Earth for long periods? Also, are there economically useful activities in space that can sustain human communities there? "We don’t know which of these outcomes represents our long-term future," Pace said. "Advocates and skeptics may believe one outcome or another is most likely, but no one actually knows. Determining the actual future of humans in space would be a watershed event for the United States and humanity."